The capital of Western Australia, Perth sits where the Swan River meets the southwestern coast. The riverside Kings Park offers panoramic views of the city, while sandy beaches line the suburb. The cultural centre houses the state opera and ballet companies, occupying its own central precinct including the Art Gallery of Western Australia, library and a theatre. In addition to sandy, pristine beaches, the coastal metropolis of Perth delivers plentiful events throughout the calendar year. 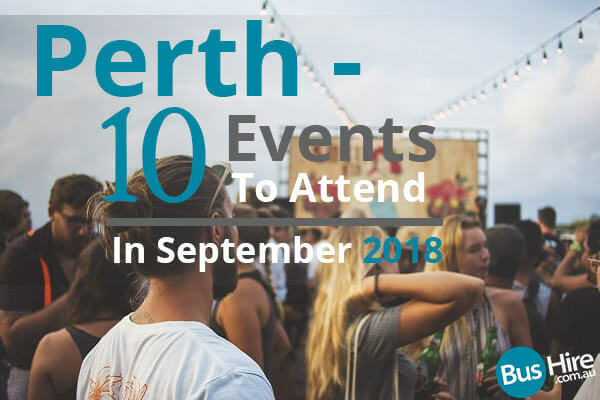 Choose bus hire in Perth to attend some of these exciting events scheduled for September 2018. Anyone who loves singing can join us on the night of 4th September at downtown Freo. This is how it works; you get a lyric sheet and join a group of lows, mids or highs and master 3-part harmonies for a pop song. You don’t have to be a pro in singing, as this is just a fun night out for those who love to sing in a comfortable ambiance. You are surely going to love the atmosphere! This is a great opportunity for people looking to build reliable and trusted networking relationships with each other. At Meeting Minds, you get a chance to interact with people, discuss issues and look for cooperative partnering opportunities. The event has been highly successful given its focus on building trust, growing relationships and knowing other members. Like-minded people share their business opportunities, their knowledge and their experiences, hence creating a trusted and solid network base. Promising yet another stellar event, the SPASA is organising the largest pool, spa and outdoor living expo of Western Australia, this September at the Claremont Showgrounds. The 2-day event starting 8th of September will have everything that is required for creating a dream backyard. It’s not just limited to spas and pools; there will be landscaping, live demonstrations, pool renovations and pool equipment. Over 70 exhibitors will be there to showcase some of the best ideas in outdoor living. Whether you want to create an entertaining space for the whole family or add value to your home, you will get some of the best brands at great bargains. Queens Of The Stone Age will be performing on the 12th of September at the Perth Arena. Following multiple Grammy nominations, hundreds of epic shows and 6 genre-defining albums, this beautiful bunch of freaks have amazed audiences from all across the globe. Rock ‘n’ roll just doesn’t get any better with these talented players performing with a synergy. Being one of the best rock bands in the world, you just cannot afford to miss out on their masterpiece in Villains. The Australian Tattoo Events welcomes you for an exciting weekend of entertainment, art and tattoos. On the 14th of September, you will come across the most talented national and international tattoo artists coming together at the Perth Convention and Exhibition Centre. You get a chance to research the latest trends, and participate in tattoo competitions. There will be a jam-packed entertainment program with the Fuel Girls showing all the way from UK, with their high octane pyrotechnics. Streetwear fans are going to have a good time with Sullen Clothing bringing the Sullen Angels competition for the first time. Chittering is full of walking trails, wineries, art, boutique farms and beautiful hidden valleys. At this spring festival, they celebrate wildflowers, history and art throughout the region. Events on the oval include Historic Vehicle Day, Bindoon Farmer’s Market and senior’s picnic on the Friday. The town comes alive with stunning wildflowers, rejoicing the season with its annual festival. You will enjoy a wide range of activities, along with a display of wildflower specimens at Old Gingin Road. All this will be taking place from the 14th to 16th of September. This September on the 16th, the hip-hop Powerhouse TECH N9NE is returning to Australia for a non-stop party. Their live shows are not for the faint hearted people. You will literally hang onto his every movement, with the rhymes so fast that will make your head swirl. KRIZZ KALIKO will be joining them on the centre stage as the feature support. Don’t miss this golden chance to experience greatest live shows in hip-hop. Starting 22nd of September, the Night Zoo will rejoice the special connection that humans and animals have together, and the joy brought into our lives by the animals. Jamie lives in a busy, fast-paced city, and she is not allowed to have a pet in her house. One night, she dreams of visiting a zoo, and she discovers the joy that animals can bring into her life. The show has an amazing cast of puppets and characters, including an elephant, giraffe, penguin and more. This fantastic piece of theatre reminds us that we all need a friend in life. On the 23rd of September, this fundraising event will take place at the Avon Park inviting merchants from all across Europe to come and trade their products. There is plenty of room for catapults, archers and other displays, along with food, music, entertainment and stalls. If you are looking to camp, you can do so, although you will need consent. There will be plenty of children’s activities and performances including archery and weapon displays, re-enactments, blacksmith display, dance groups and warriors in mock battles. With some fine ceramic art on display, POTober is a 3-day extravaganza of workshops, starting 28th of September. You get a chance to learn from the best ceramicists from across India and Australia. This time, the North Metropolitan TAFE will be hosting the event organised by Cher Shakleton of Ceramic Arts Western Australia. Stuart McKay will be constructing a small kiln built from a stainless steel pipe, while Kasirajan Subbaiah will be building a horse, 2 meter high. Use Private Jet Hire To Arrive At The Audi Hamilton Island Race Week In Style!